Burns is the pastor who delivered an angry prayer at the Republican National Convention, calling on God to help “defeat the liberal Democratic Party.” He also said in a March rally that Bernie Sanders “doesn’t believe in God,” adding, “Bernie gotta get saved. He gotta meet Jesus… He gotta have a ‘coming to Jesus’ meeting.” (Sanders, who has repeatedly said he’s not an atheist, is Jewish.) And just this past week, he tweeted a picture of Hillary Clinton in blackface. 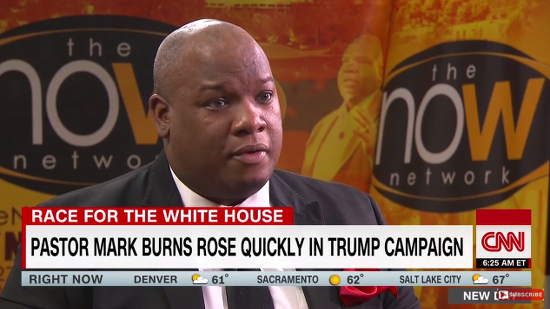 It turns out Burns, for all his public religiosity, has been lying about his own credentials, and he was caught red-handed during an interview with CNN’s Victor Blackwell. Burns claimed on his church’s website that he earned a Bachelor of Science degree (he hasn’t) and spent six years serving in the Army Reserve (he didn’t). Burns… was never in the Army Reserve. He was in the South Carolina National Guard, from which he was discharged in 2008, CNN found. But the site host, Wix, said there was no evidence of a hack. In the video, Burns keeps promoting the lies until the anchor directly calls him out on them, one by one, when Burns’ story quickly changes. At one point, there’s just a long awkward pause before Burns says he thought the conversation was off the record, which it wasn’t. And then, just as Trump does when confronted by facts that don’t make him look good, he blamed the reporter for being part of a media machine out to get him for not being “politically correct” and trying to “destroy” his character. He then walked out of the interview, leaving the CNN team in his church. “As a young man starting my church in Greenville, South Carolina, I overstated several details of my biography because I was worried I wouldn’t be taken seriously as a new pastor. This was wrong, I wasn’t truthful then and I have to take full responsibility for my actions,” Burns’ statement reads. How’s he taking responsibility? Is he quitting his role as a Trump surrogate? No word on that. This wasn’t an attack. This was a reporter doing his job. And a pastor who wants to convince people that Trump should be trusted as President showed us that we can’t even trust him to tell the truth about himself. What does it say about the Trump campaign, too, that Burns’ lies went undetected for this long? I mean, I know what it says. But what’s amazing is that his supporters won’t care. They will watch this interview and blame CNN for going after a black man who supports Trump. That’s the bubble they live in. Gov. John Kasich Condemns Actor Daniel Radcliffe's Atheism: "What the Hell Is Wrong With Him?" September 4, 2016 Elizabeth Smart Slams Purity Culture: "There Is Nothing That Can Detract From Your Worth"